Massive floods hit the South Korean-constructed dam that is still in progress. 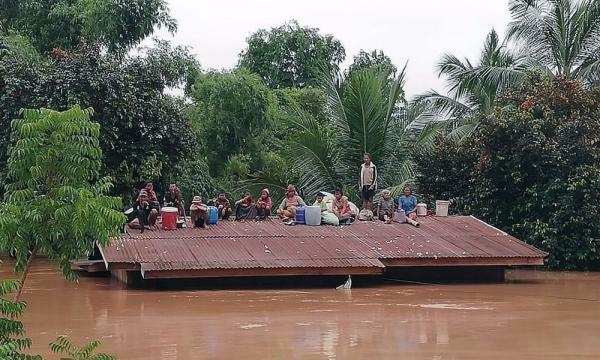 Bloomberg reports that a hydroelectric dam in Laos collapsed after one of its parts got swept away by massive flooding. The official news agency KPL confirmed that two people are dead, whilst “hundreds” are still missing. The Xepian-Xe Nam Noy hydropower dam in southeastern Attapeu province, Laos collapsed Monday evening. It released large amounts of water that swept away houses, flooded villages and made more than 6,600 people homeless. The government had declared the area an emergency disaster zone. Rescue efforts were underway as top government officials rushed to the site and public appeals were launched for aid. KPL added that continued rain and strong winds predicted for the next few days could make the situation worse. The dam was built by a joint venture led by two South Korean companies with Thai and Lao partners and was still under construction. SK Engineering & Construction, one of the two South Korean partners, said in a statement that "part of the upper area" of one of five auxiliary dams at the project "got swept away" Sunday night after several days of heavy rain. It said the auxiliary dam consisted mainly of earth and rock.